Exterior wall coatings are decorative treatments formulated for exterior masonry surfaces. 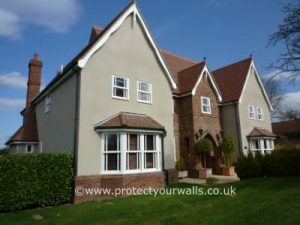 They are low maintenance, hard-wearing, and durable and will protect your property whilst giving your home a stunning decorative finish. 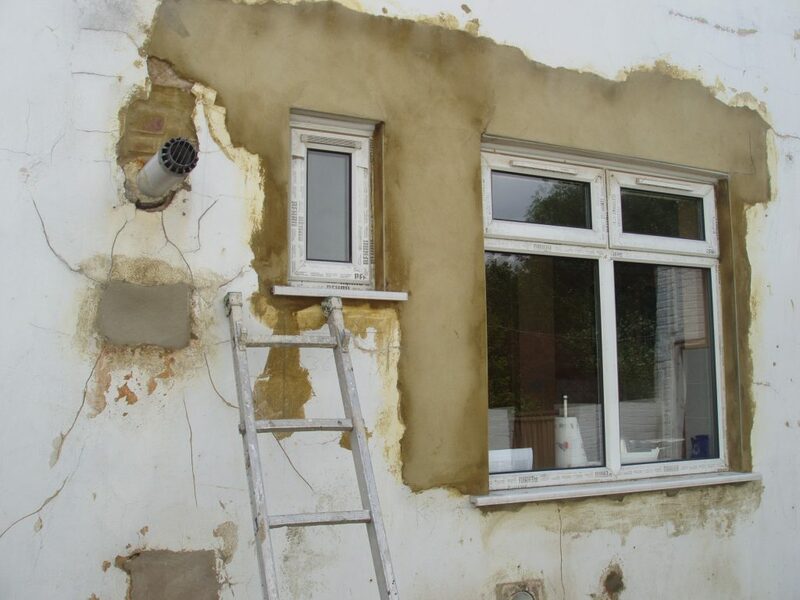 Apex Coating Services use a range of high-performance exterior wall coating systems from a number of manufacturers to suit a variety of exterior surfaces and customers’ requirements. 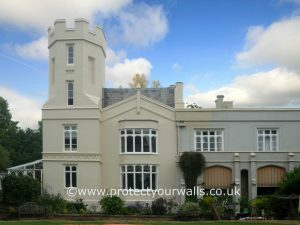 With 29 years of experience in the wall coatings industry, we are committed to working at the highest standards and use only the best wall coating materials from market leading suppliers to transform your property. 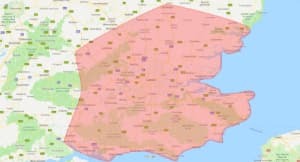 All work is guaranteed and our coatings are professionally and expertly installed in one single application by our skilled, qualified, and experienced team who always provide an excellent service to our customers. 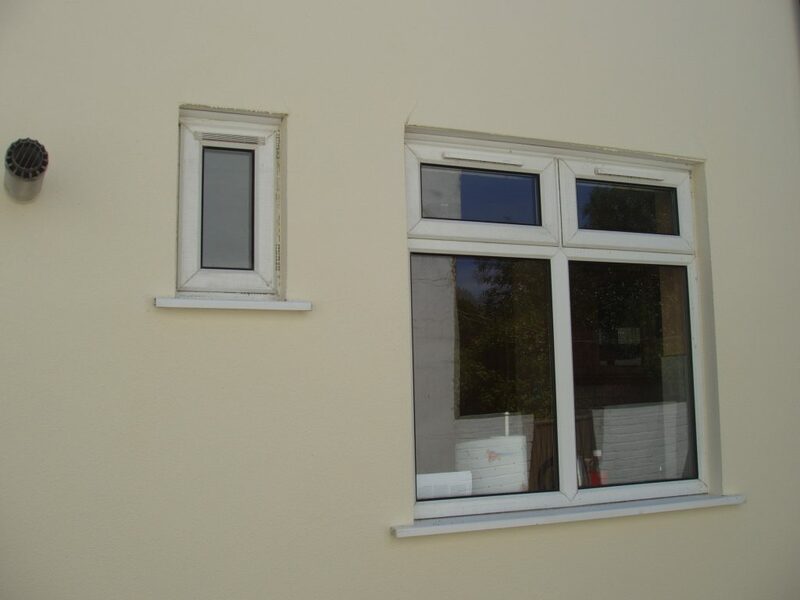 Exterior wall coatings typically have a high resin content which gives them excellent adhesion and makes them highly weather-resistant and hard-wearing. 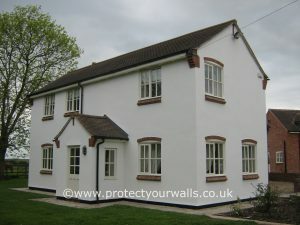 They also tend to be applied much thicker than traditional paint systems – sometimes up to 40 times thicker, making them ideal for hiding any scars and imperfections on your property’s exterior. Exterior wall coatings have long lifespans and can far outlast traditional paint, making them an excellent wall covering solution. They are very durable and are guaranteed to last for up to 15 years. 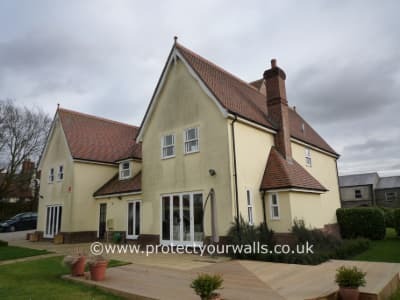 Most exterior wall coating systems are microporous which means that although they are extremely weather resistant, they are also water vapour permeable and breathable. 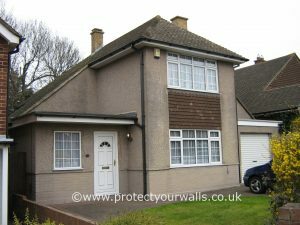 This means that they are a very effective solution for a property that is suffering from penetrating damp. 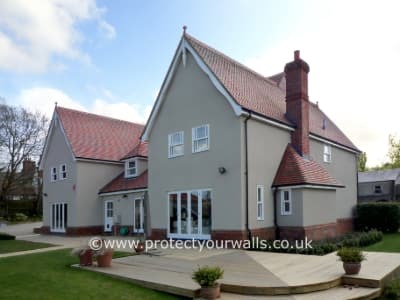 Exterior wall coatings can be applied to a range of different surfaces including render, brick, pebbledash, breezeblock, tyrolean, roughcast, spar dash, stone, and cement render, making them suitable for rejuvenating your home no matter what the exterior surface is. 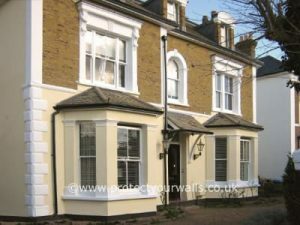 Wall coatings are available in a wide range of colours to suit any customer’s requirements and tastes. From whites, yellows, and greys to greens, blues, reds, and browns, we offer a variety of colours and shades. Alternatively, if no standard colours are suitable, a coating can be manufactured in any colour you require. Our exterior wall coatings are also available in a range of surface textures from smooth, untextured finishes and fine-textured finishes to course, heavy, bark-like textures. 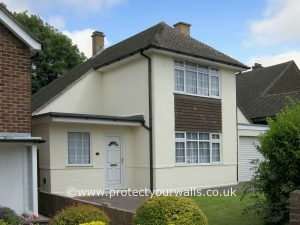 The use of a texture may not be advantageous on a new, even surface, but on older properties which have suffered from scars and imperfections or are in need of surface repairs, a system which incorporates a texture is often a huge benefit and can completely transform the appearance of a wall. The heavier the texture that is applied, the greater the coating’s ability to cover surface repairs and imperfections to create a more uniform and attractive surface finish. Request a free quote now to see colour and texture samples. The wall coating produced by Andura, a British Standards registered company (Registration No FM14830) is manufactured under the ISO 9001:2000 Quality Management System. The coating has also been assessed and approved by the British Board of Agrement – Certificate No 93/2917. 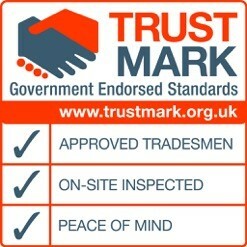 The BBA is the UK’s major approval body for construction products and installers. Browse our gallery to view some of our recent exterior wall coatings projects or check out our case studies here. 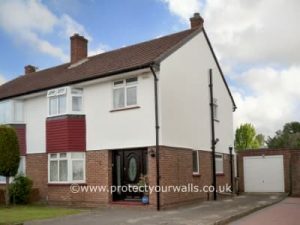 To learn more about our exterior wall coatings service or if your property requires a new exterior wall coating, contact us now or call 0800 145 5161 for your free quote.